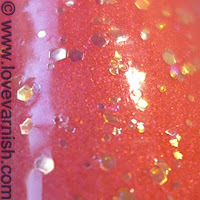 ... and it's China Glaze Flirty Tankini! Didn't feel like removing the China Glaze after a day of wear, so I slapped on the gorgeous glitter from Cult Nails. Loved the combo! I mostly wear Cult Nails Captivated layered, or sponged, because the base is kinda sheer. This way I also won't use it up so quickly because I love it too much ♥. What is your favorite way to wear Cult Nails Captivated? Ooh this is a pretty combo! Works perfectly! Love captivated over Flirtini - I cannot wait to get my hands on the new CG neons when they hit retail - so jealous of all the bloggers who got them before release. Right?! It really compliments each other. I am very very very glad to be one of the lucky bloggers! They are so gorgeous ♥. I absolutely LOVE this combo! Very pretty combo!! Unfortunately, I don't have Captivated :(. Aww.. but it is still available right? So maybe... you should order it ;)? Yes, I really should! I think I'll get on that ;0).